We love Skype. It brings us together with so many authors we wouldn't be able to chat with otherwise. Today, we bring you an interview with Sarvenaz Tash, debut author of a very charming middle grade novel, The Mapmaker and the Ghost. In this episode, we discuss why she decided to write for a middle grade audience, the development process of her book (so fascinating! 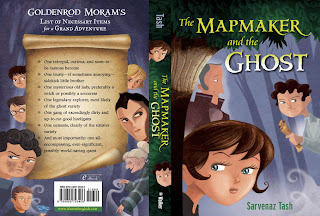 ), and how her background in film and blogging informed her writing of The Mapmaker and the Ghost. We weren't the only ones with questions though! Ms. Tash turns the tables on us at the end of the podcast and gets revenge for all the authors we've asked about karaoke in the past. Today, you will find out what our favorite karaoke jams are. Dun dun dun! Want to download a mp3 of this podcast? Click here or find us on iTunes. Hosting courtesy of archive.org. Intro music by 46bliss. Be sure to subscribe to Authors are ROCKSTARS! on iTunes and visit The Story Siren for more on her Debut Author Challenge.